I’ve been a huge Neil Gaiman fan for a long time! For those who aren’t familiar with Neil Gaiman, he is the author behind a number of amazing novels (including Stardust) and is the creator of Coraline (the same Coraline that became a hit movie). I was interested in reading Instructions because I knew it was a picture book and I wanted to see what it was about! Instructions is an interesting book, firstly, because the illustrations are fantastic! The book is illustrated by Charles Vess. I’d never seen any of Charles Vess’ illustrations before and I found them to be beautifully detailed – they captured the fantasy, gracefulness and power of the characters in the book! This book is deceptively simple. On its face, it appears to be a simple story of a character (depicted by a animal in human clothing) that is going on a journey. The book provides a set of instructions on how to make the journey. There are various suggestions, such as “Ride the wise eagle (you will not fall)” and “Trust the wolves, but do not tell them where you are going”. When you look beneath the surface, however, this book also contains some great instructions on how to travel through life (as a journey). Gaiman suggests, “Remember your name. Do not lose hope – what you seek will be found.” and “Trust dreams. Trust your heart, and trust your story.” as well as providing the instructions “Do not forget your manners. Do not look back”. Though this book looked simplistic, it really is an instruction book for life, in my opinion, as well as being the instructions for the character on the journey. I read this book multiple times, finding complex nuances in what appears to be minimal text. I think any child who enjoys fantasy will love this book for its illustrations and its story. I think adults would love it as well because of the richness that lies in the layers within the words and ideas. 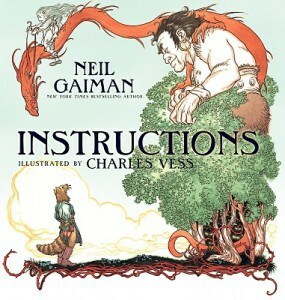 I’d recommend Instructions by Neil Gaiman as a great gift as well as something to keep for yourself!